Big Walnut’s Payton Carter (32) battles for a rebound with Olentangy Orange’s Lauren Perone (22) and Riley Duffy during the first half of Tuesday’s non-league showdown in Sunbury. 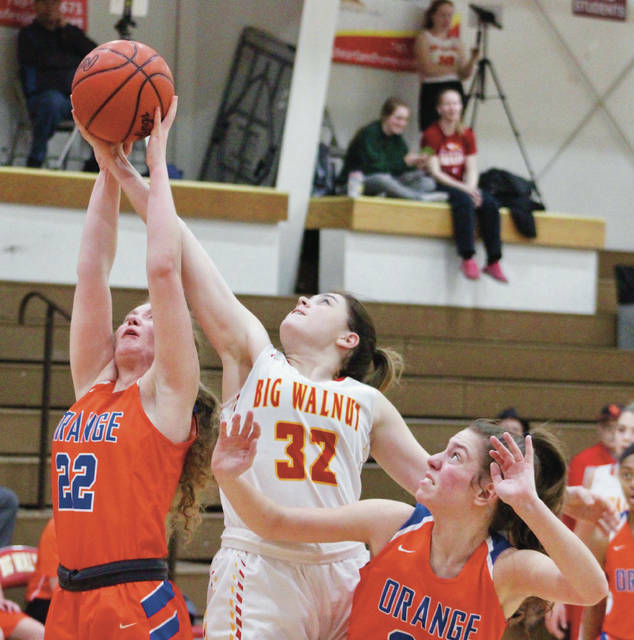 SUNBURY – The Big Walnut-Olentangy Orange rivalry in girls basketball is a little different than most simply because of Bob Scott’s ties to Big Walnut. Scott, who just picked up his 200th-career victory in Orange’s win over Westerville North Friday, coached the Golden Eagles for 13 seasons and racked up 166 of those wins before taking over the Pioneers before the 2014-15 season. BW coach Jason Crawford knew Scott from Crawford’s time as an assistant on the boys team. They’re both teachers at Big Walnut Middle School. So, there was no fooling one another Tuesday night … and that’s how the Eagles’ 44-33 win played out. It came down to two segments for BW – a 10-0 run in the first half that gave the Eagles the lead for good and a 7-0 run in the fourth quarter that put it out of reach. Lauren Perone knocked down a 3-pointer to highlight a 7-2 start for the Pioneers. Payton Carter scored underneath to tie it and Brook Stooksbury’s old-fashioned 3-point play off a put-back gave the Eagles their first lead at 12-9 with 17 seconds left in the opening quarter. Erin Boehm’s 3-pointer pushed the lead to six early in the second quarter and things hovered in a two-possession game for the remainder of the half with BW leading 20-14 at the break. Riley Duffy and Perone buried 3s on back-to-back possessions to pull the Pioneers within four midway through the fourth. But the Eagles went on a 7-0 run to put it out of reach. Alexis Schone knocked down a key three off an Avery Schone assist and Avery Schone capped the rally with a pair of baskets, the latter of which came off her own rebound. Avery Schone scored eight of her game-high 10 points in the final frame, which was the strategy for Crawford and the Eagles. She was being guarded by Orange’s Maddie Erickson, who had four fouls. Carter and Boehm each finished with nine points. Carter led with 13 rebounds and Boehm pulled down six for the Eagles (10-3), who held a 42-22 advantage on the glass. Perone had nine points and four boards; Duffy added six points, four rebounds and three assists and Anna Grabau chipped in six points, four assists and three boards to lead the Pioneers (4-10). Both teams are back at it Friday night in league competition. Orange travels to rival Liberty in OCC-Buckeye play and BW hosts Canal Winchester in OCC-Capital action. Both are scheduled to start at 7:30 p.m.